Mandible dislocation is the displacement of the mandibular condyle from the articular groove in the temporal bone. Most dislocations are managed and reduced in the emergency department with elective follow-up. However, some situations require immediate consultation with a facial surgeon. This article focuses primarily on the diagnosis and management of mandible dislocations in adults. The temporomandibular ligament, sphenomandibular ligament, and capsular ligament support the joint. Blood supply is from the superficial temporal branch of the external carotid artery. Branches from the auriculotemporal and masseteric divisions of the mandibular nerve innervate the joint. Closing of the mandible is performed by the masseter, temporalis, and medial pterygoid muscle. The jaw opens at the temporomandibular joint by traction on the mandibular neck by the lateral pterygoid muscle. Anterior dislocations are the most common and result in displacement of the condyle anterior to the articular eminence of the temporal bone. These dislocations are classified as acute, chronic recurrent, or chronic. Acute chronic dislocations result from a similar mechanism in patients with risk factors such as congenitally shallow mandibular fossa, loss of joint capsule from previous mandible dislocations, or hypermobility syndromes. Mandibular dislocations are infrequent presentations to the emergency department. Lowery et al reported seeing 37 dislocations over a 7-year period in an emergency setting with approximately 100,000 annual visits. Anterior mandible dislocations are most common and often result from nontraumatic causes. Significant morbidity associated with isolated mandible dislocations is rare. However, fractures of the mandible, maxillofacial, or orbital bones are often seen with traumatic TMJ dislocations. Mortality in cases of mandibular dislocation is usually a result of concurrent serious traumatic injuries and not from the dislocation itself. Acute anterior mandibular dislocations carry an excellent prognosis with few cases that progress to recurrent dislocation. Lateral dislocations are often associated with fractures and require open reduction. Posttraumatic ankylosis is possible for dislocations with displaced condylar fractures. Posterior dislocations occasionally require fixation of the external auditory canal and may result in hearing deficits. Superior dislocations and those unreducible by a closed technique require emergent consultation by an oromaxillofacial surgeon and should be assessed for damage to the surrounding cranial nerves and cerebral structures. Patients should be instructed to avoid opening their mouths widely to prevent recurrent dislocation. For patient education resources, see the Back, Ribs, Neck, and Head Center, Breaks, Fractures, and Dislocations Center, and Teeth and Mouth Center, as well as Temporomandibular Joint (TMJ) Syndrome, Broken Jaw, and Broken or Knocked-out Teeth. Sharma NK, Singh AK, Pandey A, Verma V, Singh S. Temporomandibular joint dislocation. Natl J Maxillofac Surg. 2015 Jan-Jun. 6 (1):16-20. [Medline]. Rattan V, Rai S, Sethi A. Midline mandibulotomy for reduction of long-standing temporomandibular joint dislocation. Craniomaxillofac Trauma Reconstr. 2013 Jun. 6 (2):127-32. [Medline]. Kahveci R, Simsek ME, Akın S, Ozbek S, Ozgenel GY, Gökmen ZG. Treatment of recurrent temporomandibular joint dislocation. J Maxillofac Oral Surg. 2013 Dec. 12 (4):379-81. [Medline]. Kotimäki J, Saarinen A. [Treatment of recurrent dislocation of the temporomandibular joint with botulinum toxin: an alternative approach]. Duodecim. 2011. 127 (19):2088-91. [Medline]. Haddon R, Peacock IV WF. Face and Jaw Emergencies. Emergency Medicine: A Comprehensive Study Guide. 6th ed. McGraw Hill; 2004. 1471-1476. Mangi Q, Ridgway PF, Ibrahim Z, Evoy D. Dislocation of the mandible. Surg Endosc. 2004 Mar. 18(3):554-6. [Medline]. Lowery LE, Beeson MS, Lum KK. The wrist pivot method, a novel technique for temporomandibular joint reduction. J Emerg Med. 2004 Aug. 27(2):167-70. [Medline]. Hoard MA, Tadje JP, Gampper TJ, Edlich RF. Traumatic chronic TMJ dislocation: report of an unusual case and discussion of management. J Craniomaxillofac Trauma. 1998 Winter. 4(4):44-7. [Medline]. Ozcelik TB, Pektas ZO. Management of chronic unilateral temporomandibular joint dislocation with a mandibular guidance prosthesis: a clinical report. J Prosthet Dent. 2008 Feb. 99(2):95-100. [Medline]. Undt G, Kermer C, Piehslinger E, Rasse M. Treatment of recurrent mandibular dislocation, Part I: Leclerc blocking procedure. Int J Oral Maxillofac Surg. 1997 Apr. 26(2):92-7. [Medline]. Stone KC, Humphries RL. Maxillofacial and head trauma. Mandible fractures. Current Diagnosis & Treatment Emergency Medicine. 6th ed. McGraw Hill; 2008. Harstall R, Gratz KW, Zwahlen RA. Mandibular condyle dislocation into the middle cranial fossa: a case report and review of literature. J Trauma. 2005 Dec. 59(6):1495-503. [Medline]. Ohura N, Ichioka S, Sudo T, Nakagawa M, Kumaido K, Nakatsuka T. Dislocation of the bilateral mandibular condyle into the middle cranial fossa: review of the literature and clinical experience. J Oral Maxillofac Surg. 2006 Jul. 64(7):1165-72. [Medline]. Schwab RA, Genners K, Robinson WA. Clinical predictors of mandibular fractures. Am J Emerg Med. 1998 May. 16(3):304-5. [Medline]. Lee SH, Son SI, Park JH, Park IS, Nam JH. Reduction of prolonged bilateral temporomandibular joint dislocation by midline mandibulotomy. Int J Oral Maxillofac Surg. 2006 Nov. 35(11):1054-6. [Medline]. Ferretti C, Bryant R, Becker P, Lawrence C. Temporomandibular joint morphology following post-traumatic ankylosis in 26 patients. Int J Oral Maxillofac Surg. 2005 Jun. 34(4):376-81. [Medline]. Talley RL, Murphy GJ, Smith SD, Baylin MA, Haden JL. Standards for the history, examination, diagnosis, and treatment of temporomandibular disorders (TMD): a position paper. American Academy of Head, Neck and Facial Pain. Cranio. 1990 Jan. 8(1):60-77. [Medline]. Alonso LL, Purcell TB. Accuracy of the tongue blade test in patients with suspected mandibular fracture. J Emerg Med. 1995 May-Jun. 13(3):297-304. [Medline]. Luyk NH, Larsen PE. The diagnosis and treatment of the dislocated mandible. Am J Emerg Med. 1989 May. 7(3):329-35. [Medline]. Bauss O, Sadat-Khonsari R, Fenske C, Engelke W, Schwestka-Polly R. Temporomandibular joint dysfunction in Marfan syndrome. Oral Surg Oral Med Oral Pathol Oral Radiol Endod. 2004 May. 97(5):592-8. [Medline]. Schuknecht B, Graetz K. Radiologic assessment of maxillofacial, mandibular, and skull base trauma. Eur Radiol. 2005 Mar. 15(3):560-8. [Medline]. Totten VY, Zambito RF. Propofol bolus facilitates reduction of luxed temporomandibular joints. J Emerg Med. 1998 May-Jun. 16(3):467-70. [Medline]. Young AL, Khan J, Thomas DC, Quek SY. Use of masseteric and deep temporal nerve blocks for reduction of mandibular dislocation. Anesth Prog. 2009 Spring. 56(1):9-13. [Medline]. [Full Text]. Awant MN. A New Approach to the Reduction of Acute Dislocation of the Temporomendibular Joint: A Report of Three Cases. British Journal of Oral and Maxillofacial surgery. 1987. 24:244-249. Chen YC, Chen CT, Lin CH, Chen YR. A safe and effective way for reduction of temporomandibular joint dislocation. Ann Plast Surg. 2007 Jan. 58(1):105-8. [Medline]. Ardehali MM, Kouhi A, Meighani A, Rad FM, Emami H. Temporomandibular joint dislocation reduction technique: a new external method vs. the traditional. Ann Plast Surg. 2009 Aug. 63(2):176-8. [Medline]. Shorey CW, Campbell JH. Dislocation of the temporomandibular joint. Oral Surg Oral Med Oral Pathol Oral Radiol Endod. 2000 Jun. 89(6):662-8. [Medline]. Ziegler CM, Haag C, Mühling J. Treatment of recurrent temporomandibular joint dislocation with intramuscular botulinum toxin injection. Clin Oral Investig. 2003 Mar. 7(1):52-5. [Medline]. Chhabra S, Chhabra N, Gupta P Jr. Recurrent Mandibular Dislocation in Geriatric Patients: Treatment and Prevention by a Simple and Non-invasive Technique. J Maxillofac Oral Surg. 2015 Mar. 14 (Suppl 1):231-4. [Medline]. Chacon GE, Dawson KH, Myall RW, Beirne OR. A comparative study of 2 imaging techniques for the diagnosis of condylar fractures in children. J Oral Maxillofac Surg. 2003 Jun. 61(6):668-72; discussion 673. [Medline]. Fonseca RJ, Walker RV, eds. Management of injuries to the temporomandibular joint region. Oral and Maxillofacial Trauma. Philadelphia: WB Saunders Co; 1991. 430-1. Gassner R, Tuli T, Hachl O, Rudisch A, Ulmer H. Cranio-maxillofacial trauma: a 10 year review of 9,543 cases with 21,067 injuries. J Craniomaxillofac Surg. 2003 Feb. 31(1):51-61. [Medline]. Laskin DM. 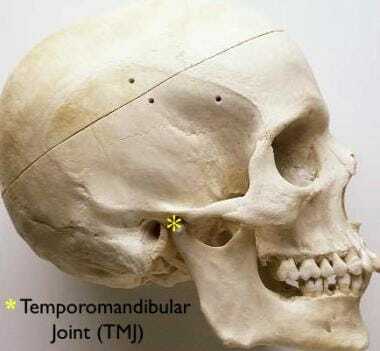 Temporomandibular joint disorders. Frederickson JM, Krause CJ, eds. Otolaryngology: Head and Neck Surgery. St. Louis: Mosby-Yearbook; 1993. 1443-50. Shun TA, Wai WT, Chiu LC. A case series of closed reduction for acute temporomandibular joint dislocation by a new approach. Eur J Emerg Med. 2006 Apr. 13(2):72-5. [Medline]. Thexton A. A Case of Ehlers-danlos Syndrome Presenting with Recurrent Dislocation of the Temporomandibular Joint. Br J Oral Surg. 1965 Mar. 3:190-3. [Medline]. van der Linden WJ. Dislocation of the mandibular condyle into the middle cranial fossa: report of a case with 5 year CT follow-up. Int J Oral Maxillofac Surg. 2003 Apr. 32(2):215-8. [Medline]. Classic reduction technique. The physician places gloved thumbs on the patient's inferior molars bilaterally, as far back as possible. The fingers of the physician are curved beneath the angle and body of the mandible. Recumbent approach. The patient is placed recumbent, and the physician stands behind the head of the patient. The physician places his or her thumbs on the inferior molars and applies downward and backward pressure until the jaw pops back into place. Wrist pivot method. The patient is placed in a sitting position, and the physician stands facing the patient. The physician grasps the mandible at the apex of the mentum with both thumbs. The fingers are placed on the inferior molars. Ipsilateral approach - extraoral route. The patient is placed in a sitting position, and the physician stands behind the patient. The physician stabilizes the patient's head with his or her nondominant hand and uses the dominant hand to apply downward pressure on the displaced condyle that is palpated just inferior to the zygomatic arch. Disclosure: Received salary from WebMD for employment.